if you are interested in any of these positions please contact me, mike bell, for more information on each role. July 2018...Studley schools enjoy more time on the green. If you need to book a function room at the Studley Sports & Social Club or just contact them please phone 01527 857708 or go to their website by clicking on their logo to the left. 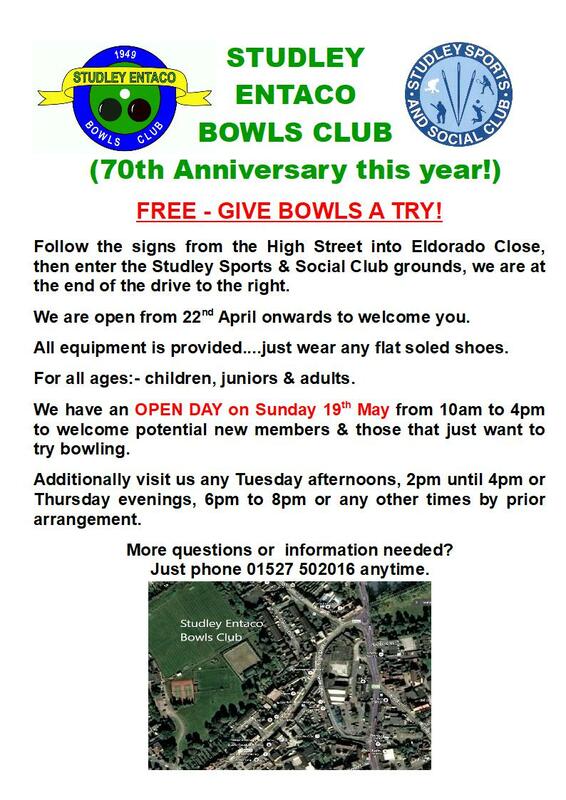 We are always looking for NEW people to join us at Studley Entaco Bowls Club. If you are interested please call Mike Bell on 01527 502016. It's FREE to try with no immediate obligation to join. 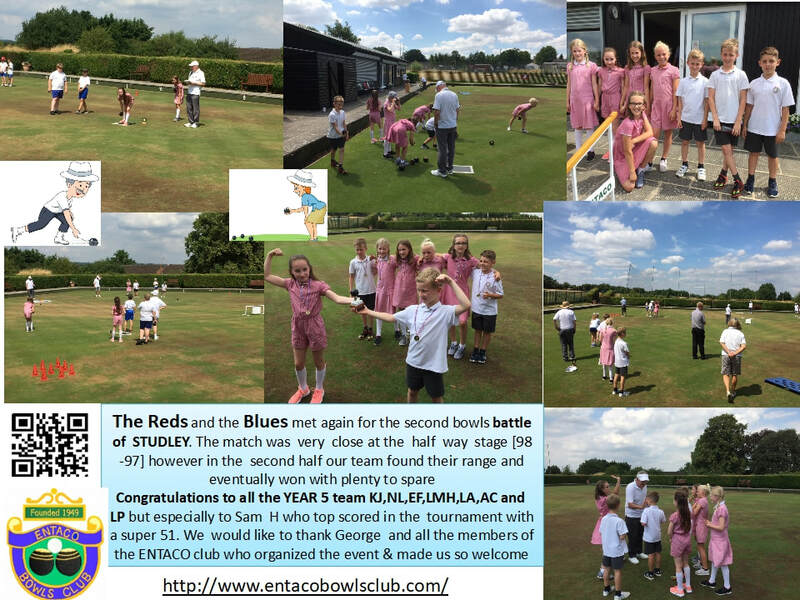 STUDLEY ENTACO is an Outdoor Flat Green bowls club. The name ENTACO comes from past ownership by:- 'The English Needle and Tackle Company', hence ENTACO. The club was founded in 1949 and is located in STUDLEY, Warwickshire. We play home and away 'friendly' games, club competitions and also compete in the local Interberga League, Redditch Triples League plus County competitions. We also host County and other prestige matches because of our fine playing green. Our website is aimed at being useful and informative for members, non members and new members... in fact for all bowls enthusiasts. Are you interested in Bowling? No initial charges are made for new bowlers so why not give it a try? We welcome new bowlers, male and female, of all ages. Come and join us on Tuesday afternoons 2 - 4 pm or Thursday evenings 6 - 8 pm during the season( April thro' Sept) or just phone one of the numbers below for more information. All you need is a flat pair of shoes or trainers. All other equipment is provided including coaching.